Best & Easiest Natural Homemade Blush + Lip Gloss! The best and easiest natural homemade blush + lip gloss ever! In my and Raj’s lecture on “Staying Cancer-Free Through Nutrition” tomorrow night at The Big Carrot, I will be briefly touching on how the toxins that we absorb from the environment and synthetic products are just as important to consider in cancer prevention/fighting as the toxins and nutrients that we consume. Our skin is our largest organ. What we put on our skin matters and we should always try to keep our body-care and cosmetic products as natural as possible. I will admit that I struggle with trying to use more natural cosmetics, especially when natural cosmetics tend to be less readily available, less pigmented, less lasting, and/or less diverse in colours. I am taking baby steps though with the more foolproof natural cosmetic products like blushes and lip glosses (I will explore the more daunting natural cosmetics like eyeliners and mascaras another time). Aside from a few drops of filtered water, these are the only two other ingredients! Although there are numerous natural cosmetic companies out there making wonderful blushes and lip glosses, I wanted to make my own two-in-one (blush + lip gloss) from scratch. Unlike all the more natural blushes and lip glosses I have seen on the market , I wanted mine to be completely free of preservatives, made with minimal ingredients, and good enough to eat! I finally came up with a super easy recipe that requires only three (edible) ingredients and that makes an absolutely gorgeous blush and lip gloss! It is LITERALLY good enough to eat! In a very small bowl (i.e. dipping sauce bowl), add the red beetroot powder and then stir in the hot filtered water a few drops at a time until the red beetroot powder/crystals have dissolved and the mixture has a syrup-like consistency. Find a small glass jar, in which you would like to store this two-in-one blush + lip gloss product. 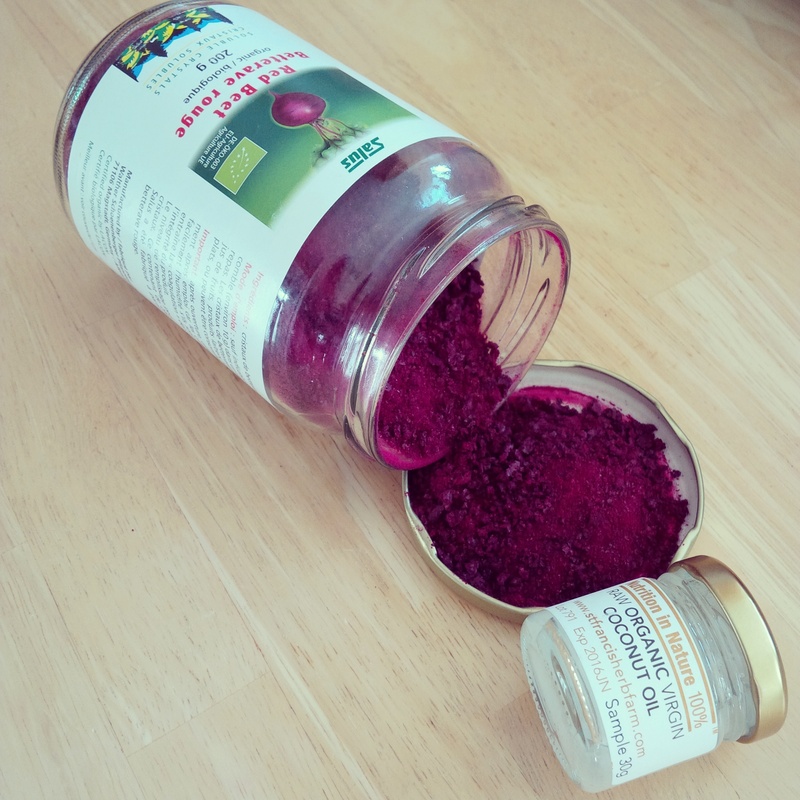 Pour the liquid raw organic virgin coconut oil and the water-dissolved red beetroot powder/crystals into this small glass jar. Close the lid tightly and then shake the jar well to mix everything together. The coconut oil should turn deep red in colour (it will apply pink on the skin though). Place the jar in the freezer for about a hour to let the contents solidify and then keep it stored in the refrigerator. 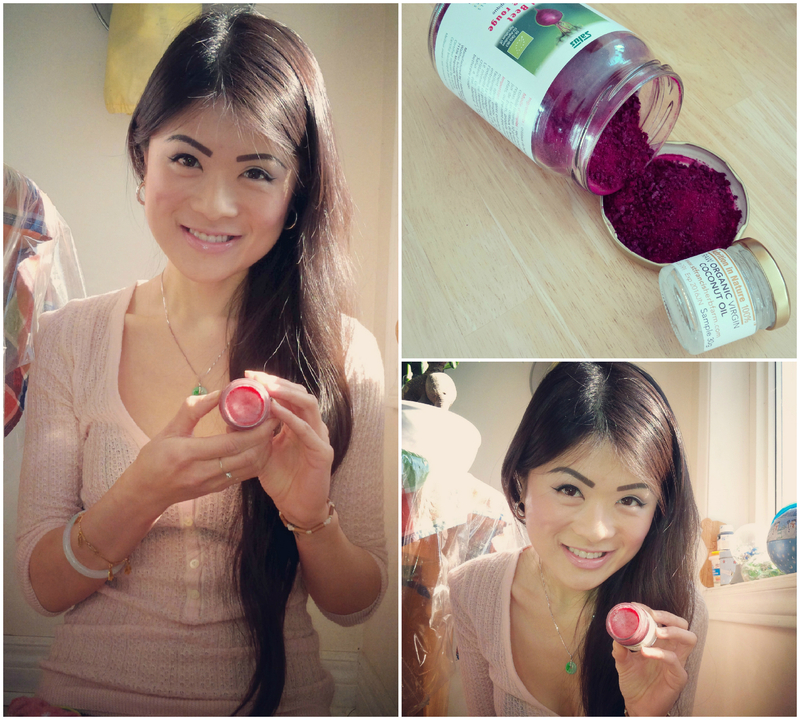 Take it out of the refrigerator anytime you want to apply a gorgeous berry pink colour on your cheeks and/or lips. Enjoy! 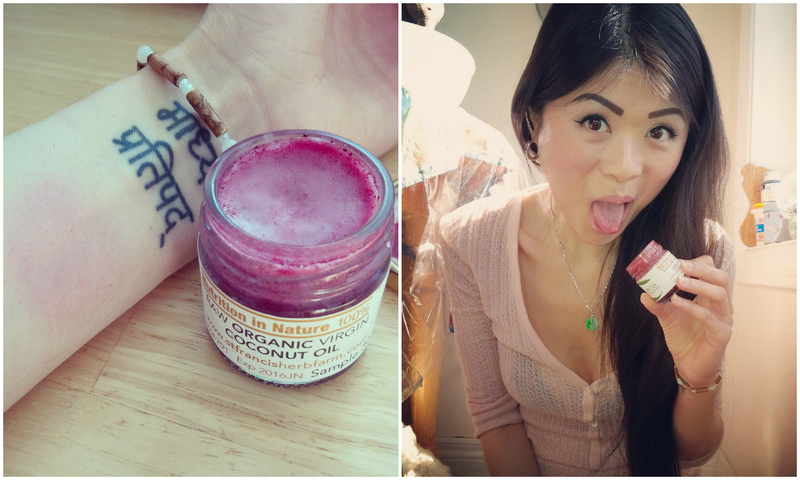 Who knew beets and coconut oil could be so pretty on the skin?